The german cockroach is a small roach ranging between 10-15 mm in length. Their bodies are light brown with two dark parallel lines running from the back of the head down to their wings. German cockroach wings are fully developed, however they cannot fly. German cockroaches are found any place humans dwell and are unable to survive without living near human activity. German cockroaches nourish their bodies with food scraps and water left behind by humans. They are also adverse to cool temperatures and require man-made heat to survive cold winter months. German cockroaches are thigmotactic, meaning they like to live in tight fitting areas to avoid detection. They are most active at night and during the day they hide behind cabinets, under appliances and behind slight wall openings. German cockroaches take approximately 28 days to hatch out of the eggs. Eggs are deposited in protected egg cases containing 30-40 eggs. The egg case is brown and approximately 8 mm long. Nymphs do not resemble adult german cockroaches. They are small, dark brown to black and do not have wings. At room temperature, the nymphs mature in approximately 60 days. The adult stage is completed within 100 days. Adult german cockroaches have a lifespan of approximately 20 to 30 weeks. German cockroaches are omnivores, consuming both plant and animal based foods. German roaches prefer fatty foods, starches and sugars. When german cockroaches are infesting residential homes, they will consume household items like paper, glue, toothpaste and leather. German cockroaches are also cannibals, and will eat each other when food is scarce. Disease producing organisms such as viruses and bacteria have been found on german cockroaches. German cockroaches transport pathogenic organisms, contaminate food with their feces and defensive secretions, bite humans and feed on feces. Side effects from german cockroach infestations may include illness from food poisoning, dysentery and allergies or asthma. German cockroaches secrete foul odors that can be detected when infestations are high. 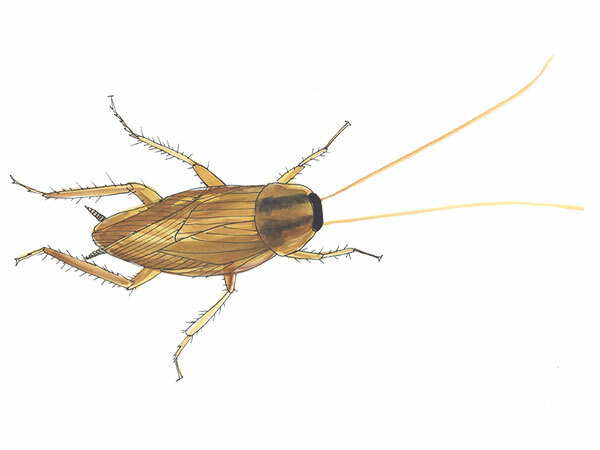 German cockroach secretions can change the flavors of food and cause allergies such as coughing, sneezing, watering eyes and congested nasal passages. Female german cockroaches lay their eggs in a hard protective case called the ootheca, which is carried around until just before they hatch. Deposited egg cases are easily identified during severe infestations. German cockroach feces are small black pellets that resemble ground coffee. German cockroach feces can cause serious allergies and illnesses during heavy infestations. German cockroach feces contain proteins that trigger allergic responses such as asthma. Clean kitchen surfaces regularly and rinse off dishes before placing into the dishwasher. German cockroaches thrive in areas with access to human food. Refrain from filling pet food bowls up to unnecessary levels. Pet food attracts german cockroaches and provides a convenient food source. Vacuum and clean the house regularly and pay close attention the kitchen floors. Store food in tight fitting containers or zip-lock bags. Reduce moist environments and fix water leaks. German cockroaches like moist environments and live near areas with access to water. Keep tight fitting lids on trashcans and discard of trash bags regularly. At the beginning of an infestation, german cockroaches are usually concentrated in the kitchen and bathrooms. As the infestation progresses, german cockroaches venture into new areas. Next, use an aerosol flushing insecticide to flush german cockroaches out from hiding places. Use aerosol insecticide on live cockroaches that scurry out of hiding places after flushing. Using baits can eliminate 90% of a german cockroach infestation within one week. A single german cockroach can spread a lethal dose of bait to over 40 german roaches after one feeding. Before placing baits use a flashlight to find areas where german cockroaches are hiding. The bait must be applied in highly trafficked areas. Place the bait in harboring areas such as behind kitchen cabinets, under the stove or fridge, under sink cabinets and inside any small cracks or crevices. Check on the bait periodically and supply fresh bait in areas where activity is high. Do not apply bait in areas where insecticide has been placed. Dont live with roaches. Call us today for a free cockroach consultation. We serve Anna Maria roach control, Palmetto roach control, Holmes Beach roach control and surrounding areas. We are available to get rid of roaches from your home. We service Sarasota roach control, Siesta Key roach control, Longboat Key roach control, Gulf Gate roach control, Lido Key roach control and surrounding areas.